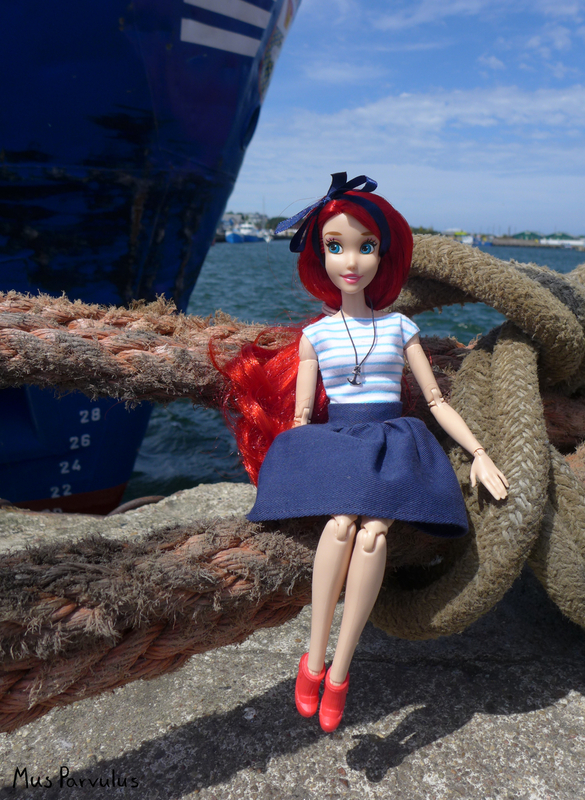 I have recently upgraded my Ruby Red Fashionista with a Made to Move body. When trees started blooming, I wanted her to be my model. 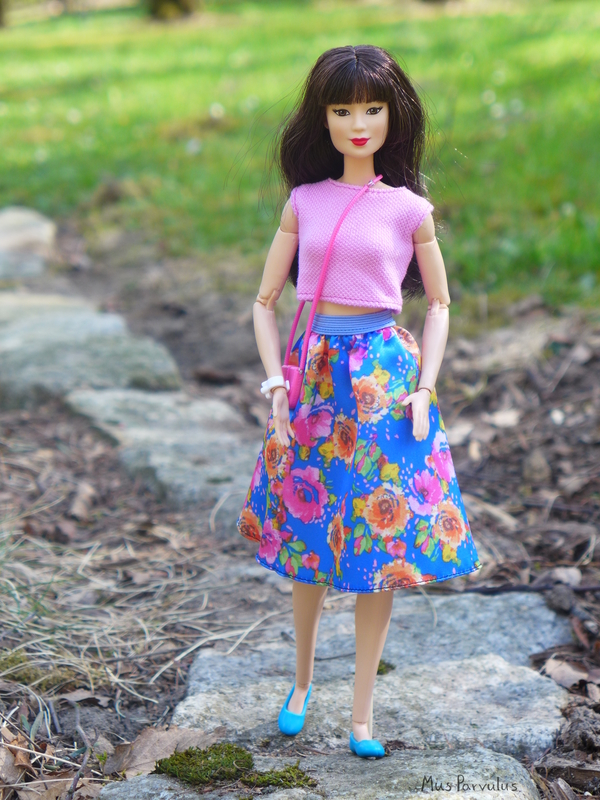 In all fairness, my original plan was to take photos of my new Mulan among the blossoms – and I did bring her as well – but I wanted to reset the visual ‘taste buds’ before posting about her again. With the Fashionista, I mostly stopped by the last tree. 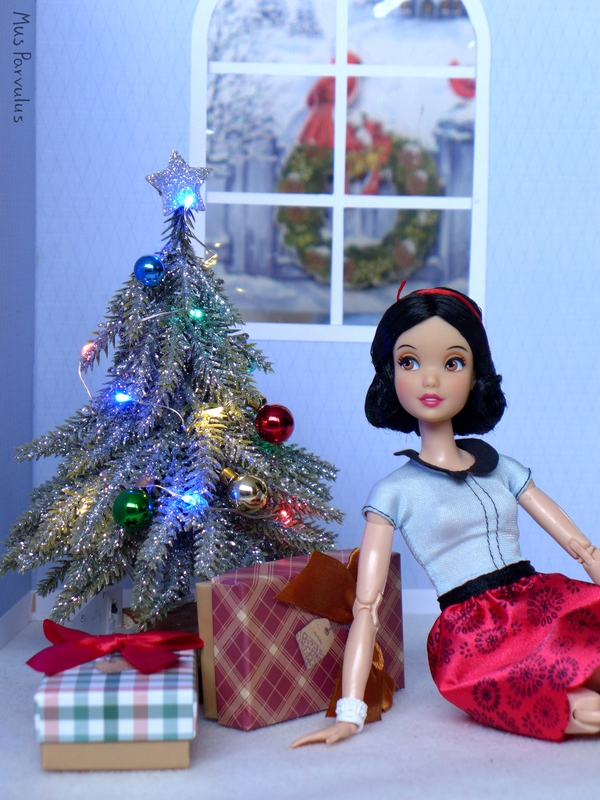 I had not prepared a special outfit in advance, so I dressed the doll in a top and skirt from a fashion pack. I would have loved to make her a kimono of sorts, but I just couldn’t find the right fabric. 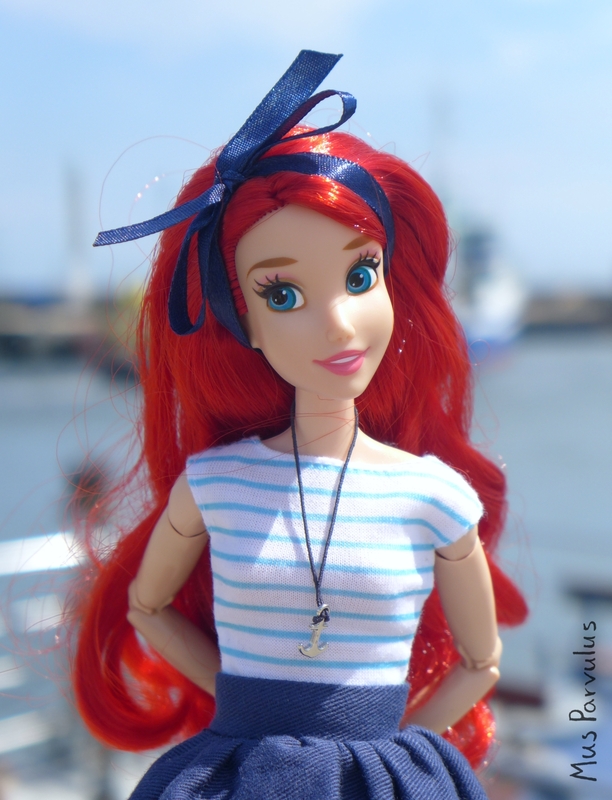 She is very lovely doll and it was great to finally let her be more expressive with an articulated body. I always wanted her, even when I wasn’t sure whether I would be able to re-body her, but the original, stiff Fashionista bodies do stifle creativity. This one last tree in bloom is probably not a cherry, hence the title of the post 🙂 It had pink petals as well, but much more fine. 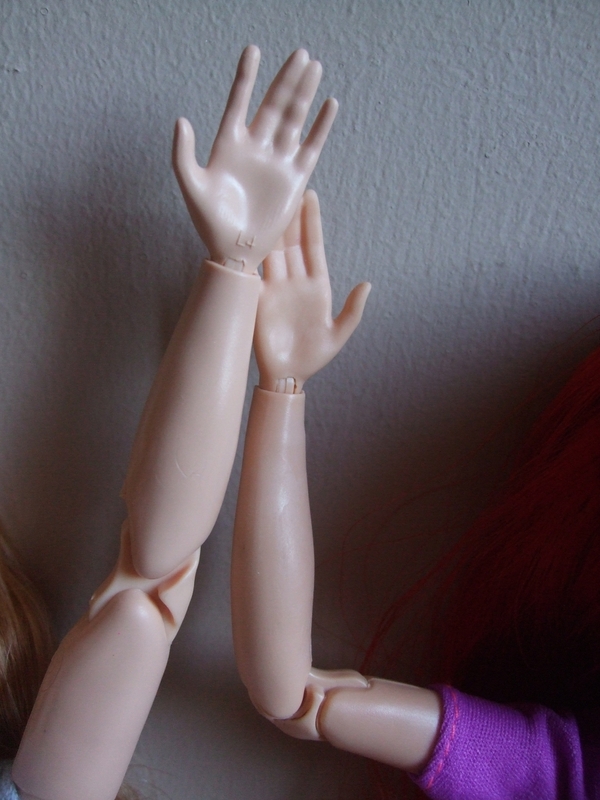 That actually made them a better scale for the doll. 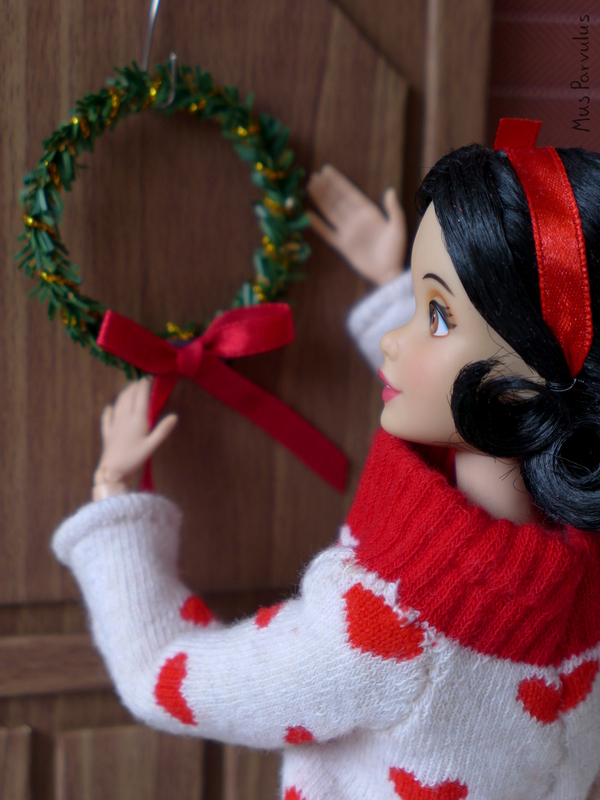 Recently, I have been focusing more on Barbie clothes. Unfortunately, buying them separately isn’t always that great of a bargain. 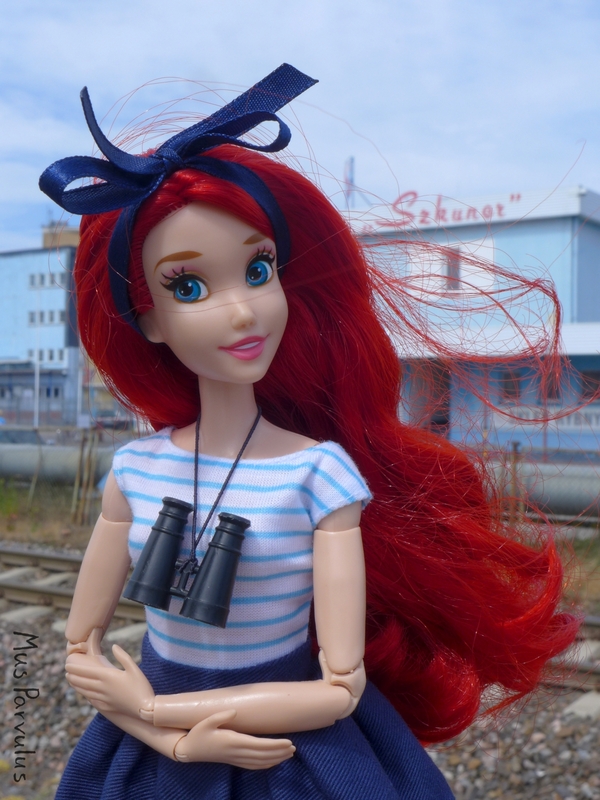 I have figured that it pays more to get a nicely dressed Barbie Fashionista and expand both the doll and the fashions collection in one go. Due to my recent interest in pastel hair, I was especially intrigued by the “Blue Violet” Fashionista and in the “Tutu Cool” one – both are very cute and come with nice outfits – especially much needed tops. I hate sewing tops 🙂 (Other than that, there are plenty of pastel-haired options!) Unfortunately, I had some trouble finding either one – until I ran into a single “Blue Violet” during recent shopping trip. Yay! I kept seeing number 34 and 37 above, but, for some reason, this Petite was nowhere to be found. 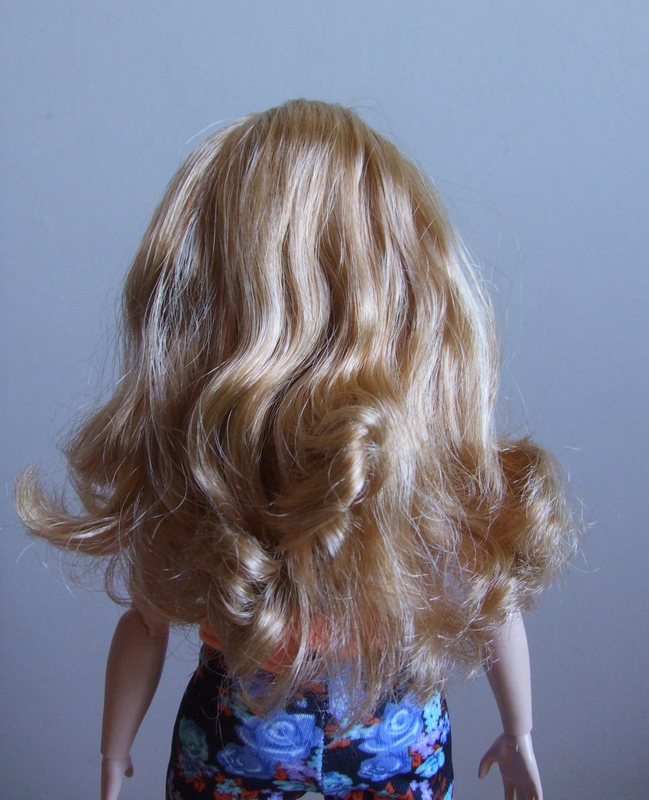 This doll comes with two tops, two bottoms, two pairs of shoes, two bags and a dress. Not a bad boost to the Barbie wardrobe! Out of the box, she wears a black and white t-shirt that closes with a velcro, a pair of shorts with tights attached to them, yellow shoes and a bow. It’s a colorful and imaginative outfit. I’m only not a fan of the shoes. They look a bit weird and it feels like the soles are at on odd angle that makes her lean forward. You also have to be very careful not to tear the tights while pulling the shoes on. 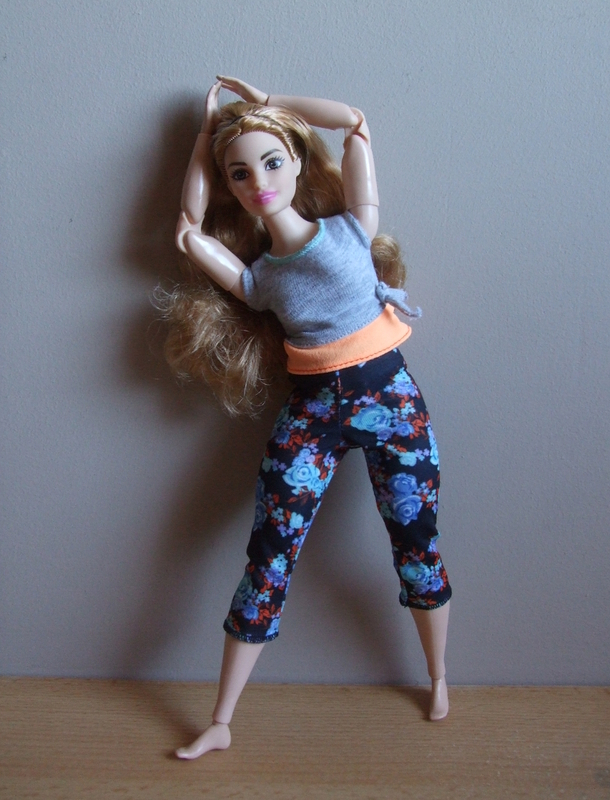 The top can also be paired with denim capris. They are good enough, versatile jeans. They don’t have a lot of detail, and only a simple jeggings type finish at the waistline. The second top is pink with a peplum and a black collar. It is adorable! Unfrotunately, the collar is a tad crooked. It goes well with the jeans and the second pair of shoes. I like these shoes. They have a smart retro feel to them. The print looks fairly realistic and is covered with some pearlescent glitter. It sheds a little bit, but nothing too too crazy. Here is a closer look at the bags. I happen to have the heart-shaped one in a different colour, but the pink one is new for me. I would love for all Barbie bags to open, but even though these don’t, they are nice enough accessories to enrich an outfit. 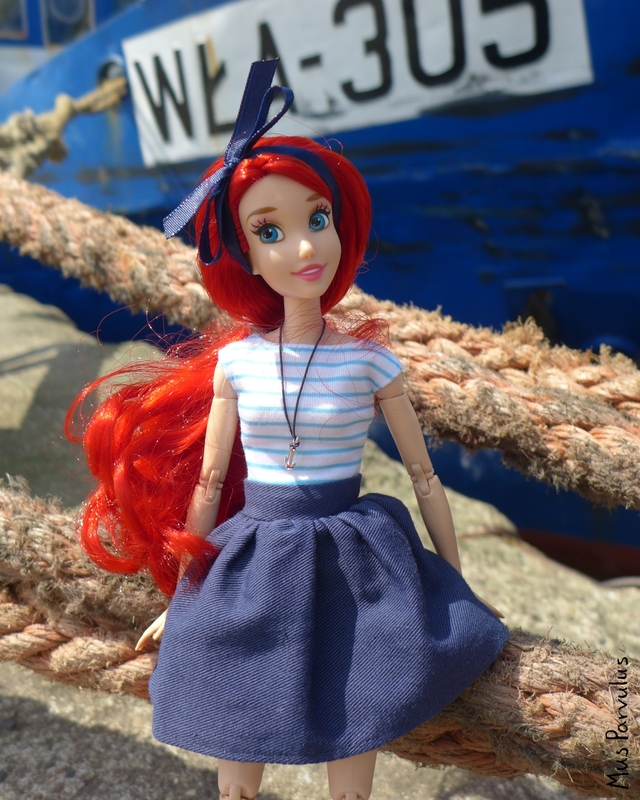 I do love all the fun clothes and accessories that I received with the doll, but the doll herself is no less cute. She has a very kind looking face. It is the ‘Mbili’ mould. I definitely approve of her soft, neutral lip colour. Perhaps the most fun aspect of her look is her two-toned pastel hair. It makes me think of cotton candy and magic 🙂 The doll’s name evidently comes from this hairstyle, however, the ‘Violet’ part looks almost pink. 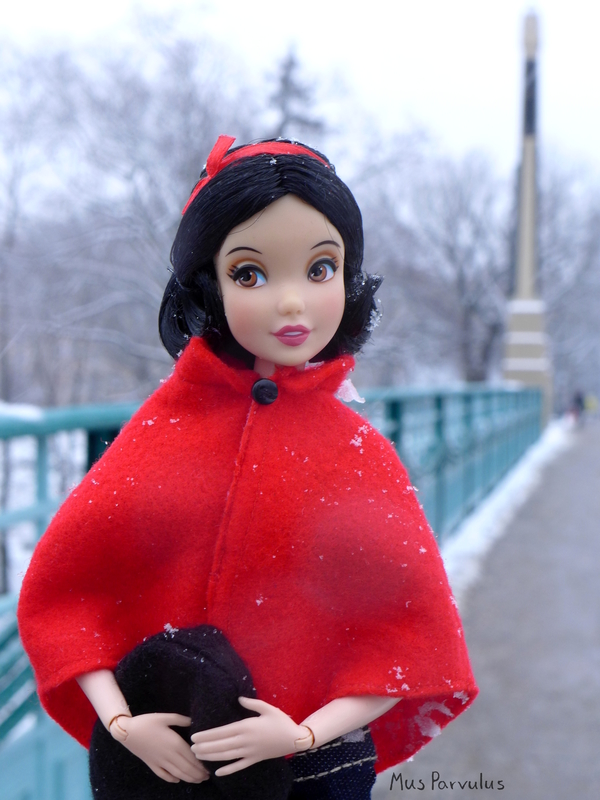 As mentioned in the title, this doll has a Petite body. She is somewhat shorter than the Original. Her chest and hips are also slightly smaller. 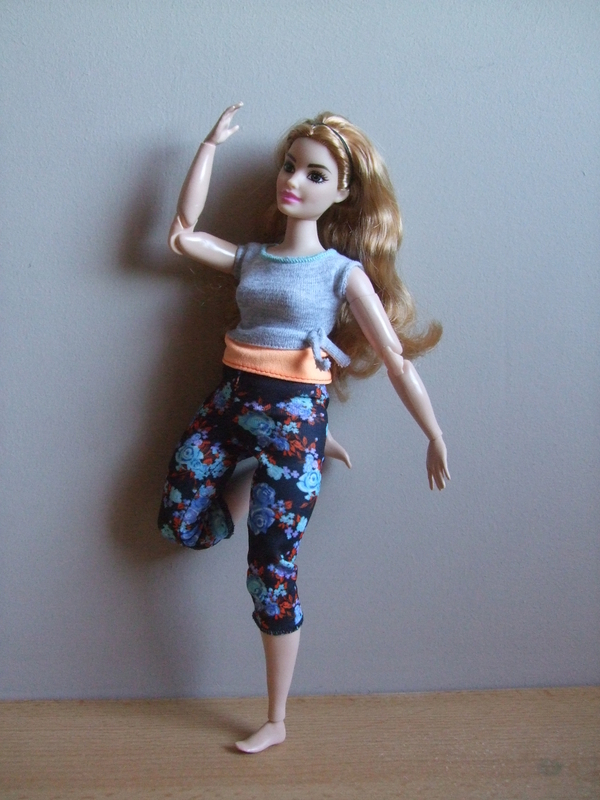 This doll happens to only have articulation that allows her to rotate her arms, also move them to the side, the same with her legs – they go back and forth and somewhat to the side. I’ve read that she matches the Yellow Top Made to Move, but then she would no longer be a petite… I don’t believe there yet exist a Petite MtM of any skin tone. 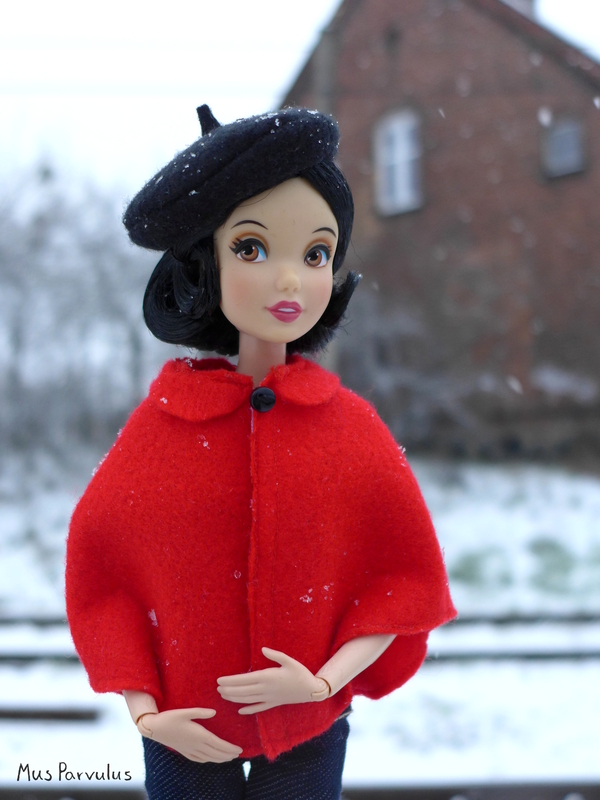 The option of putting her on an Original MtM raises an important question: do petite Barbie clothes fit an Original Barbie body? 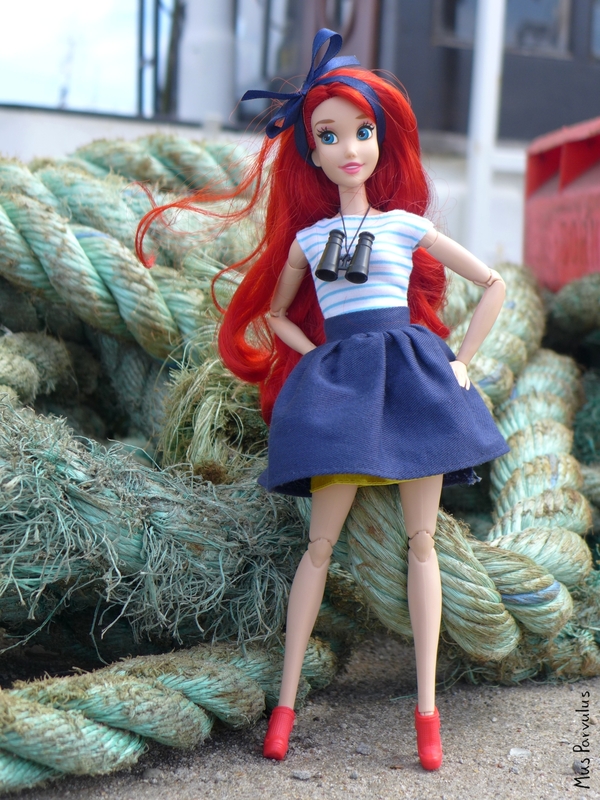 This is also important to me because I am hoping to use the fashions with other dolls. The answers is… so so, with some excpetions. 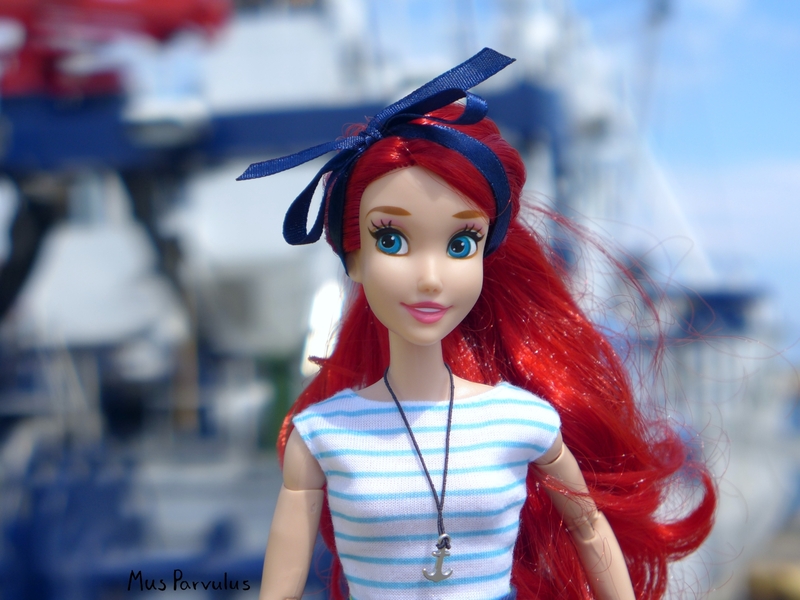 This Ariel head is on the Purple Top Original MtM. The peplum top looks a bit short, but I think it could be worn with a high waisted skirt. The capris look alright to me. They don’t feel particularly tight either. The top exposes a bit of the belly, but is perfectly wearable. I did not have any trouble closing it in the back either. The dress looks pretty short on her. Perhaps a pair of tight leggings could salvage this this outfit? Finally, the shorts with tights are a definite wardrobe malfunction. They are just a tad too short to pull up all the way. Even if you’d cut off the tights, I’m not certain the velcro would close around her waist. 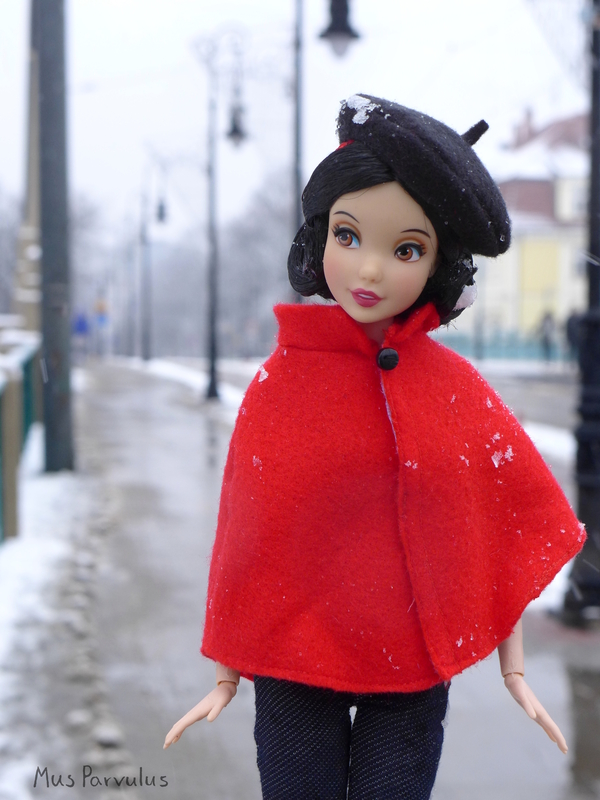 The next thing to consider is what options are available to the Petite doll. 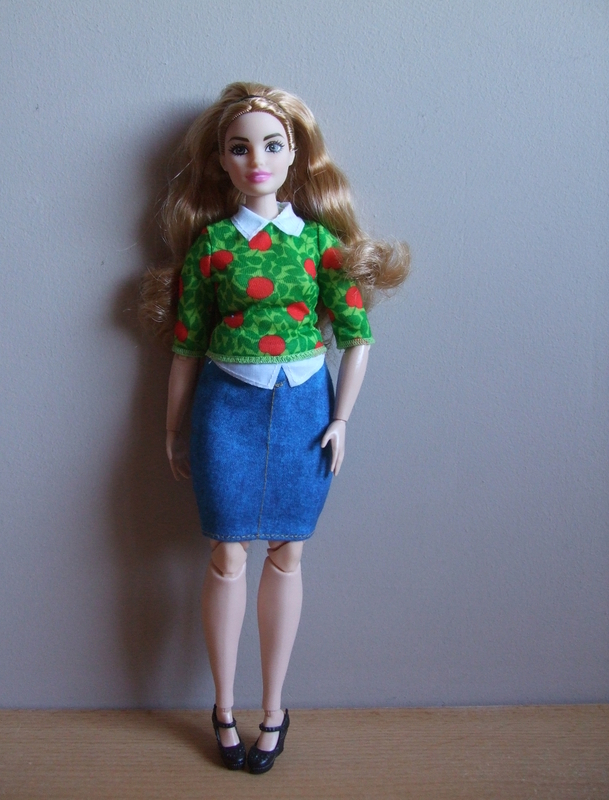 Actually, I’d say that Original Barbie fashions fit her quite well. 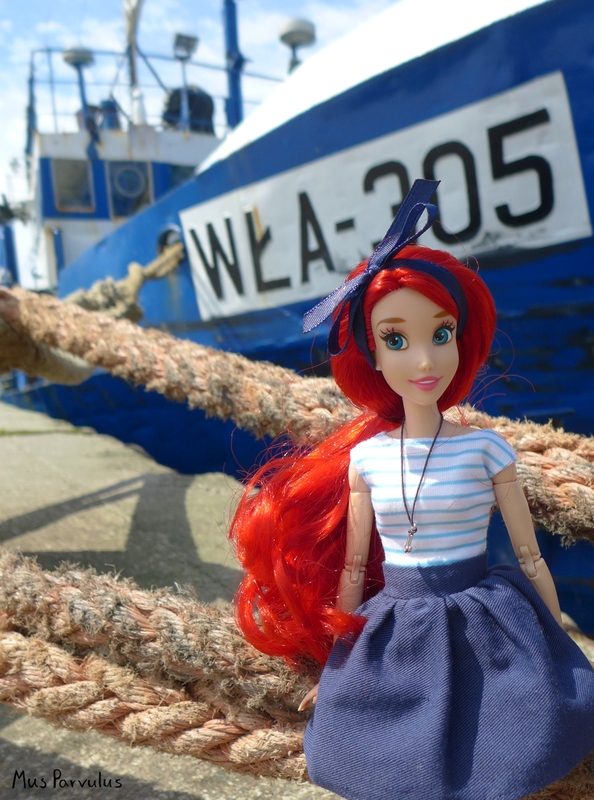 It looks like the Petite “Blue Violet” will be able to borrow clothes from her doll friends, and in some cases even return the favour. 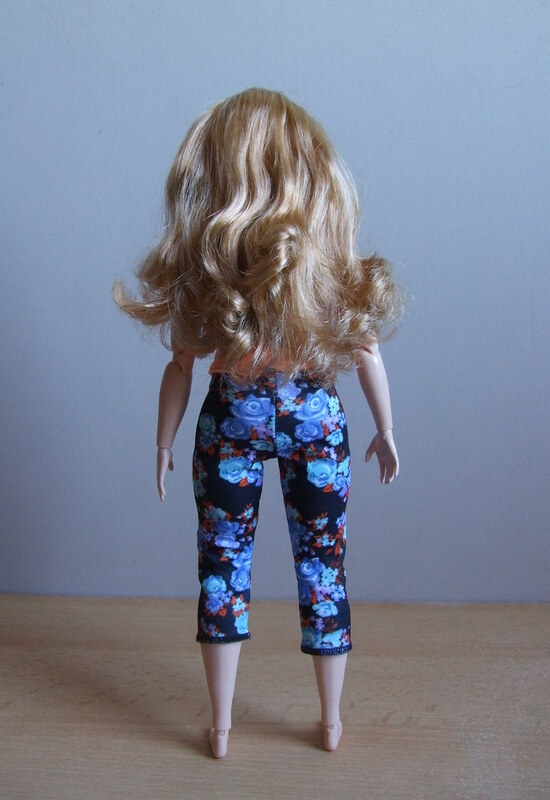 Given my aim to expand my Barbie wardrobe, I’m mostly satisfied. I also think she would make a good gift for a child. 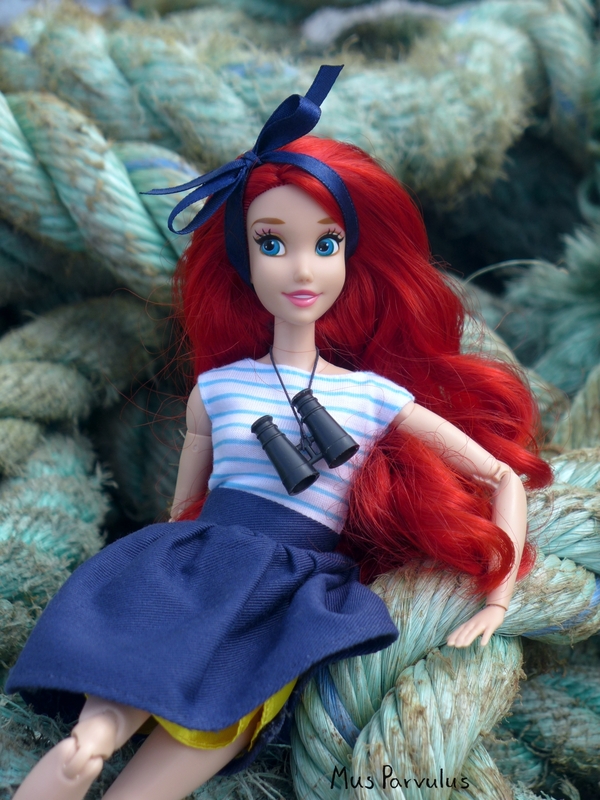 The included outfits open up the door to a lot of mixing, matching and overall play – even when other dolls and fashions are not around. 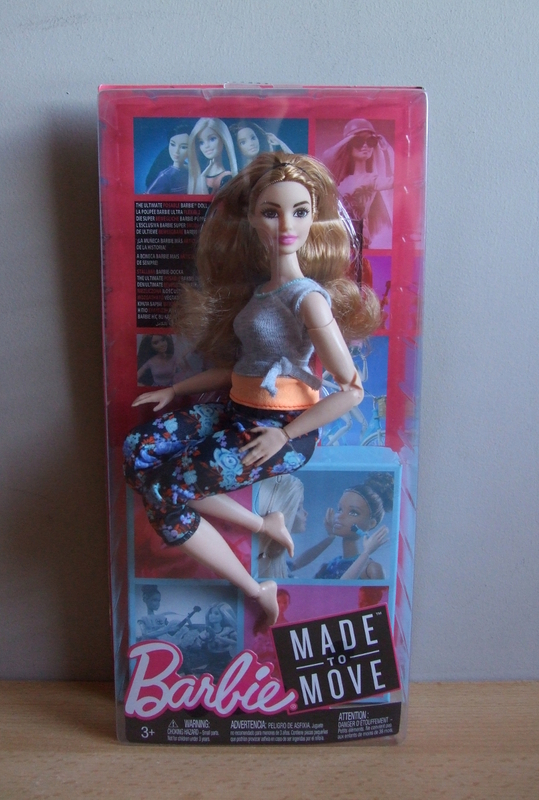 New Made to Move Barbies have hit the local stores! And, it so happens, I was lucky to get my hands on one of them – my favourite of the series – the curvy one with strawberry blonde hair. Peach was packaged in the same type of blister box as the previous series. What immediately strikes me as different is their updated outfits. They are the same cut as before – tops and leggings – but now there is a knot on the top, and the leggings have a floral pattern. 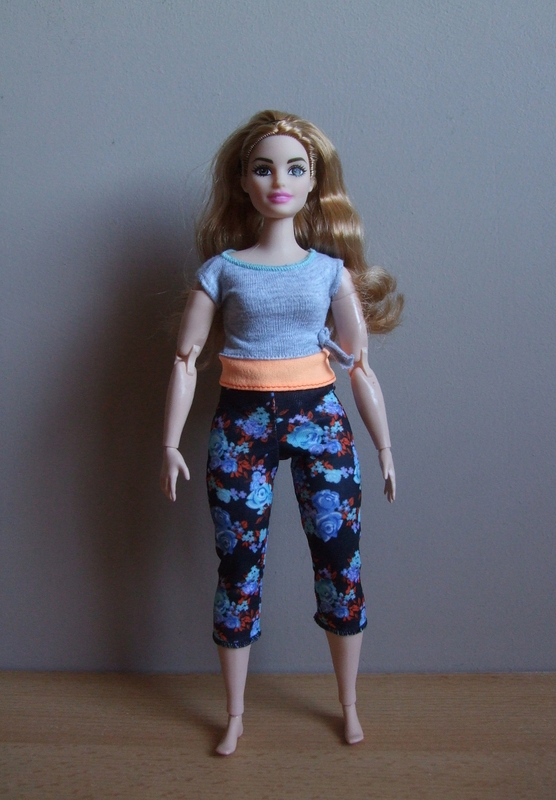 This doll wears a grey top with a light blue hem and a peachy/orange stripe. The flowers on her black leggings are blue with reddish leaves. Unlike older Made to Move outfits of this style, the top fastens with a velcro. It used to be that they had to be pulled over their head or up through their legs. 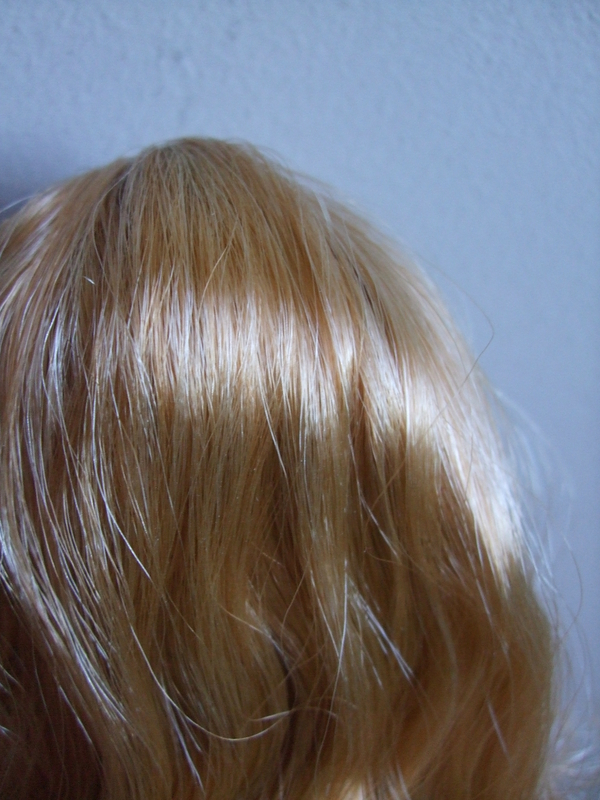 The hair is composed of two blended colours. It is a frequent feature nowadays, but I’m still pleasantly surprised every time at how nice and natural it looks. Peach is also wearing a headband. It is in fact a simple black rubber band, making it perhaps not the most practical or durable, but it does look cute. Paired with her hair colour, she reminds of Disney’s Aurora. 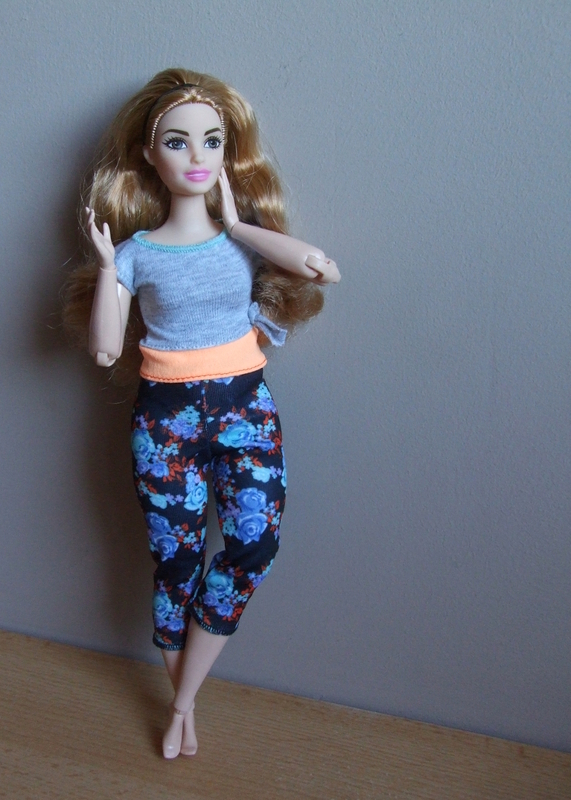 Seeing Curvy Barbies on YouTube, I was always under the impression that they are barely curvier than the original body type. I was wrong! 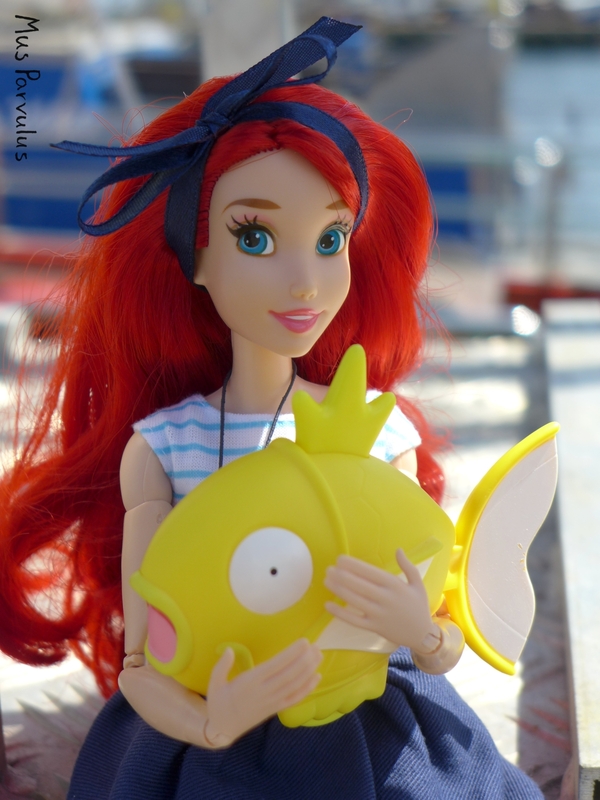 You can definitely see the difference in person, it is somehow more obvious when you hold the doll in your hands. The most different aspect about it is her thighs. They are definitely wider. She is broader in her hips too, but it’s not as striking. 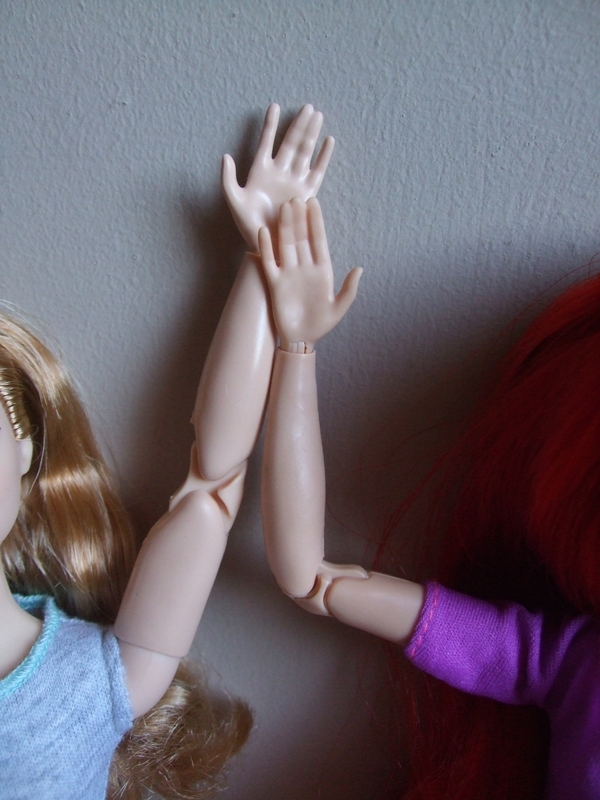 Even though the other differences are subtle, they did not straight up give her the ‘original’ Barbie limbs. 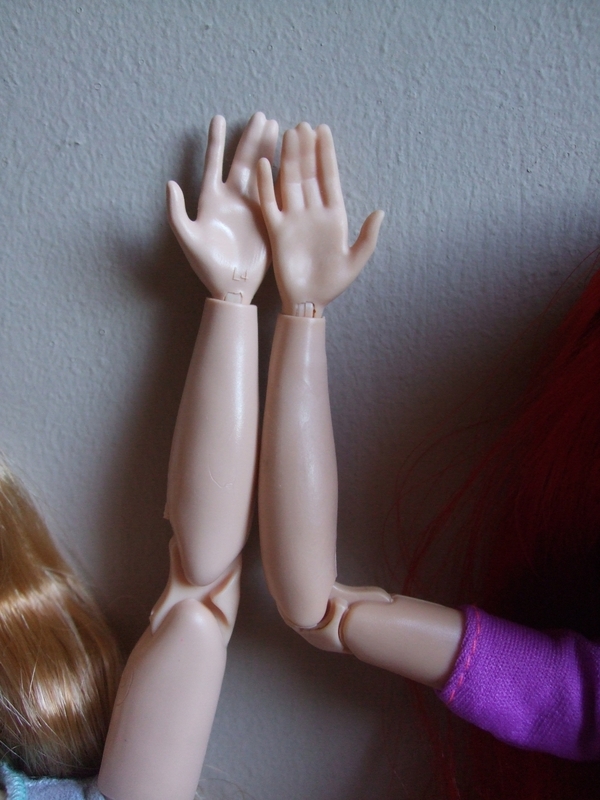 Her arms, hands and feet are also of a different shape. Skin tone wise, this Curvy is considered equivalent to the Purple Top/Lea, however, she seems even lighter, if only slightly. It might be an unintentional factory difference. Her face is so sweet. She has pink lips and brownish-greenish-greyish eyes – an earthy, natural hue 🙂 She has fairly prominent eyebrows, but they are in balance with her other features. 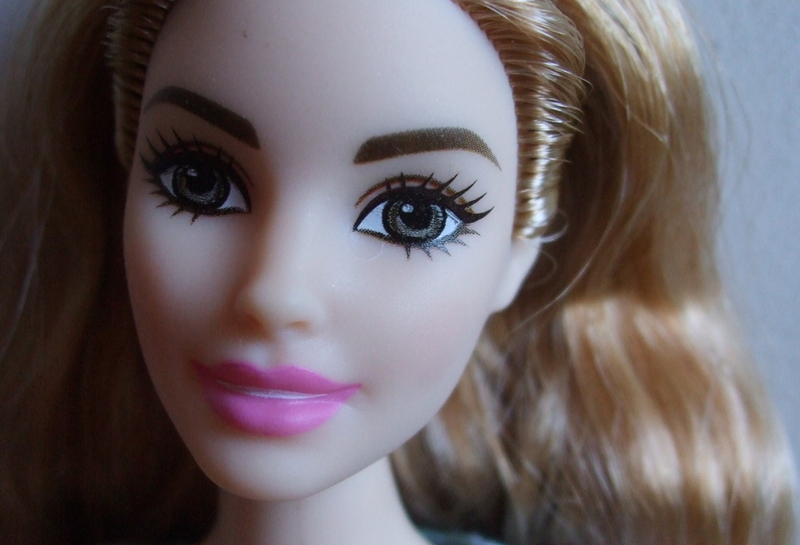 The lips are a very sweet pink, and the only part of her face which looks like like it has make-up on it. On the negative side, there are some quality issues. 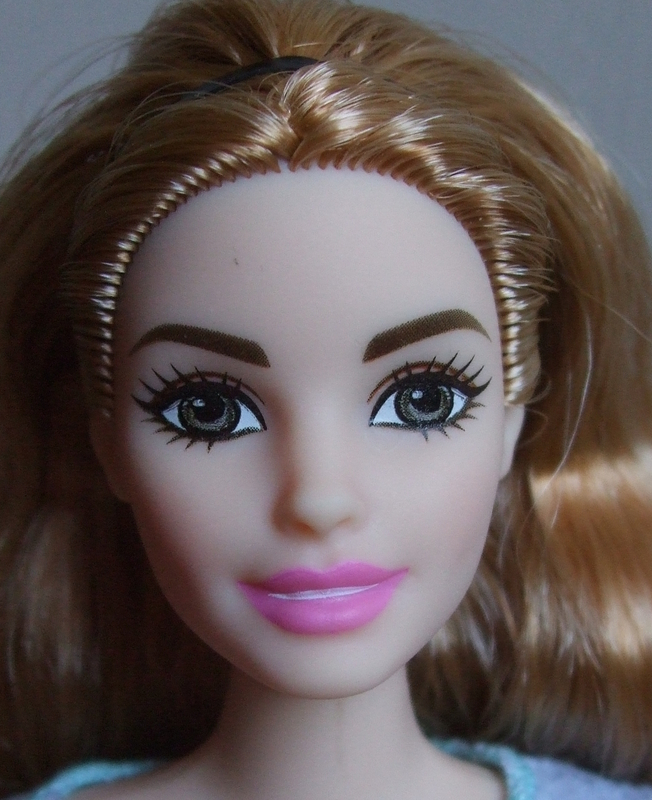 First of all, the overwhelming majority of the dolls of this model that I saw while shopping had wonky eyes – this one is the only item that was spot on. Two more could have been considered passable. The rest, four or five of the ones that I saw, had eyes that were very obviously askew. 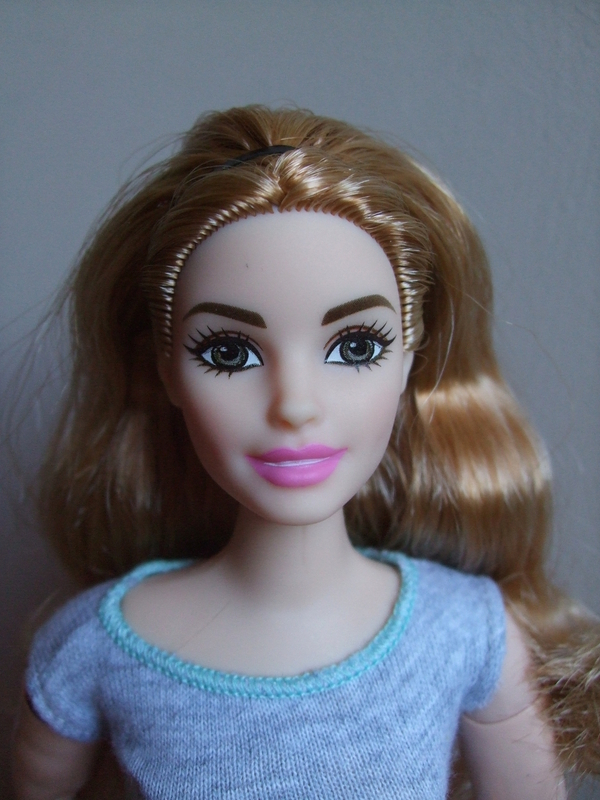 Given this experience, I would not be willing to buy this doll online, except only as a ‘body donor’. Secondly, the trade off for the perfect eyes on this token was slightly odd lips – even though it’s hard to tell without comparison. They are slightly tilted and there doesn’t seem to be enough of the white for the teeth. Luckily, lips should be relatively easy to repaint. Also, the quality of the print isn’t great. The pixels are quite obvious when you look at them, but thankfully not immediately noticeable from afar. Finally, there was a little drop of something under one of here eyes. I’m not sure yet if it will come off, I’m a little afraid to try to remove it with nail polish. It’s not a big deal, though. That’s all the problems in the face area. There are, however, very visible mouldlines on her body as well. The only exception is the range of her head movement. She can’t look down pretty much at all (but she can look up and to the sides just fine). 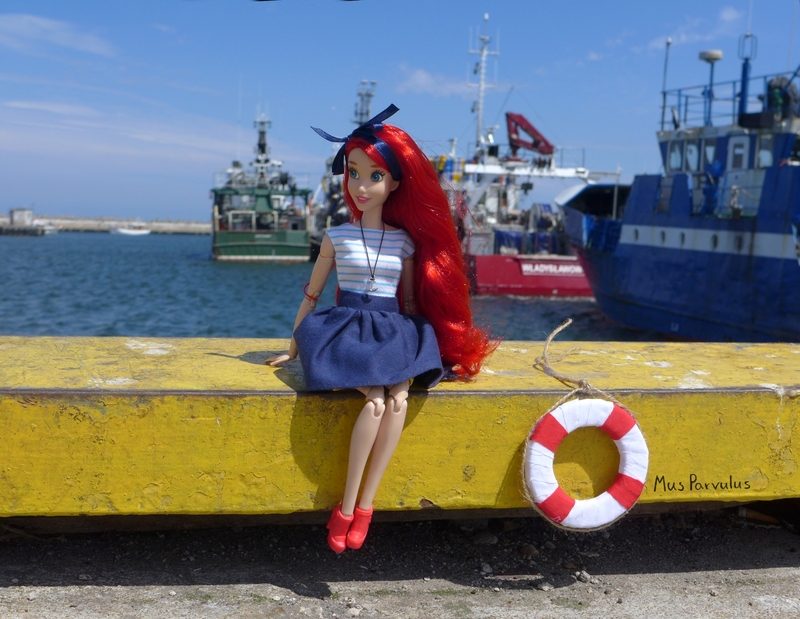 I don’t know if it’s an isolated defect, a downgrade in the 2018 series of MtM dolls or an unfortunate feature of all Curvies. It’s a shame indeed for me. 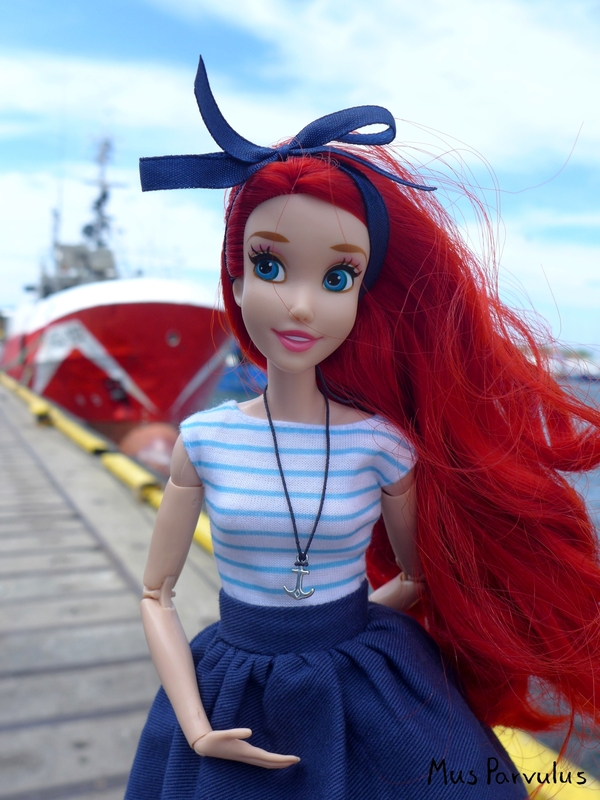 I find that tilting the doll’s chin downwards makes for much better photos – it makes it look more like the doll is at the viewer’s eye level. Peach would not fit in any form fitting clothes borrowed from the original Barbie, but she looks great in the ‘one size fits most’ fashion pack outfits that I own. 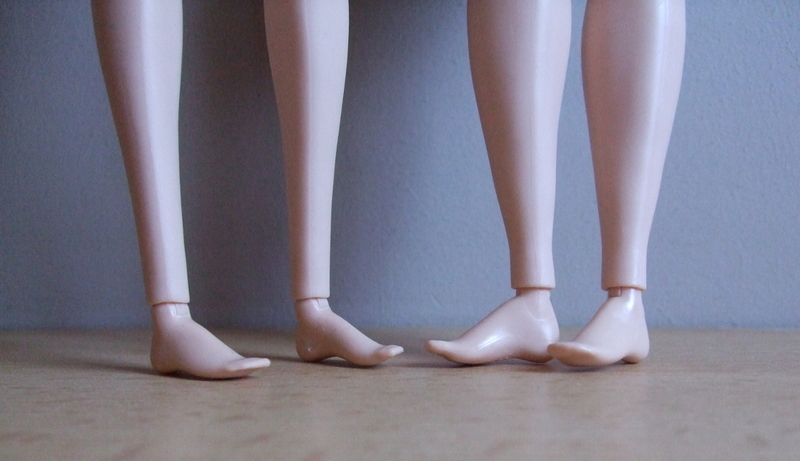 She cannot fit some of the classic Barbie shoes either, but you can buy shoes packs designed especially for her. 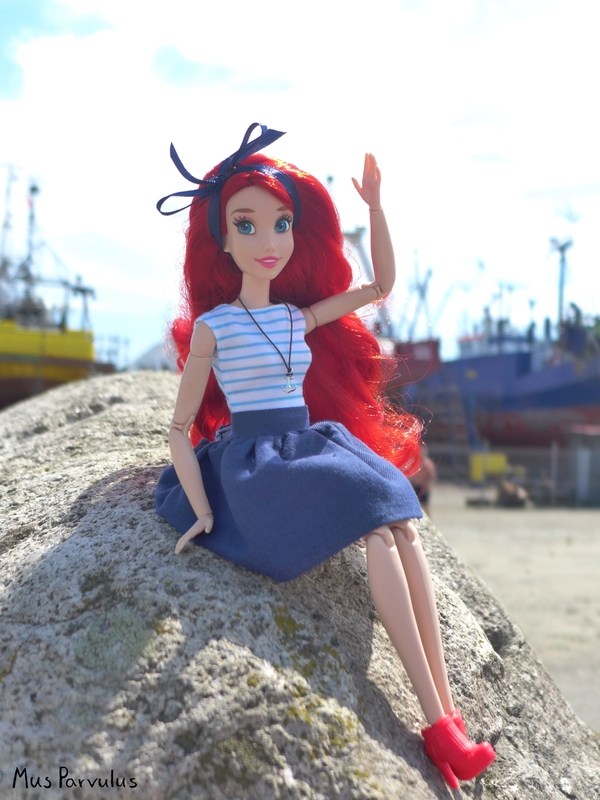 I wish she came with a pair of sneakers of her own to make it easier for people who don’t already own a wide selection of Barbie accessories. 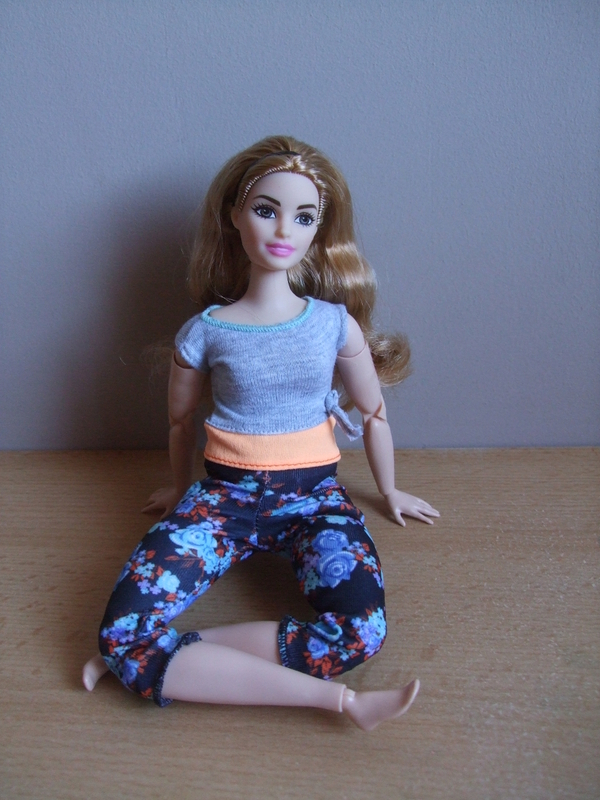 I bought the 2018 Curvy Made to Move doll for two reasons: first, because I thought she was adorable character and a new doll body type for me – basically, an overall interesting Barbie in her own right. The second reason was to try and see how well she could substitute for the hard to get ‘Purple top’ MtM as a ‘nostalgic’ skin tone body donor. As for the first reason for purchase, I am satisfied. As for the second one – I’m not sure. She would fit some characters and some face shapes, but not all, in my subjective view. Especially that if you rebody a Disney Store princess onto a Curvy – like I intended – she won’t fit her original dress anymore. 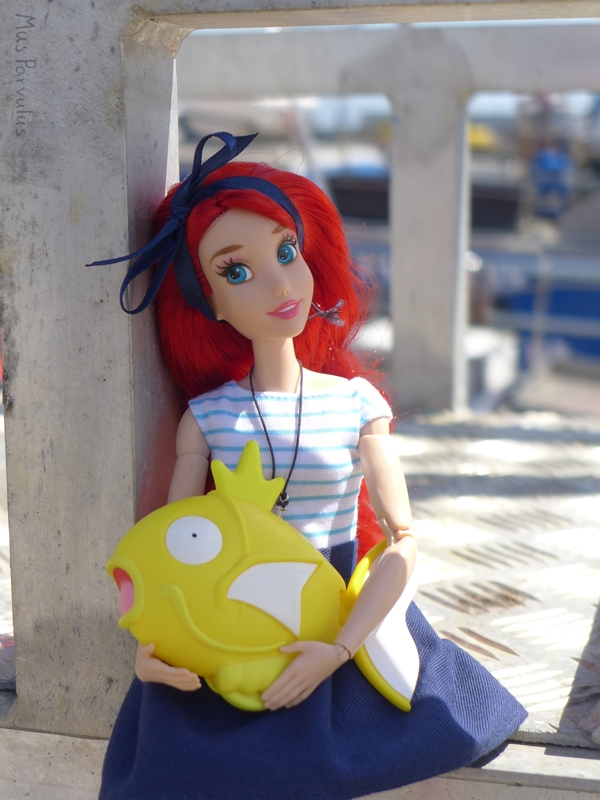 As is often the case with playline dolls – the only dolls I end up collecting – this Curvy MtM can definitely bring joy to the kid and the collector alike, but is not exactly a top quality product that you can trust blindly. Overall, I think she deserves a place on your shelves and in your hearts, but finding one that is really well made may require some extra caution and diligence. 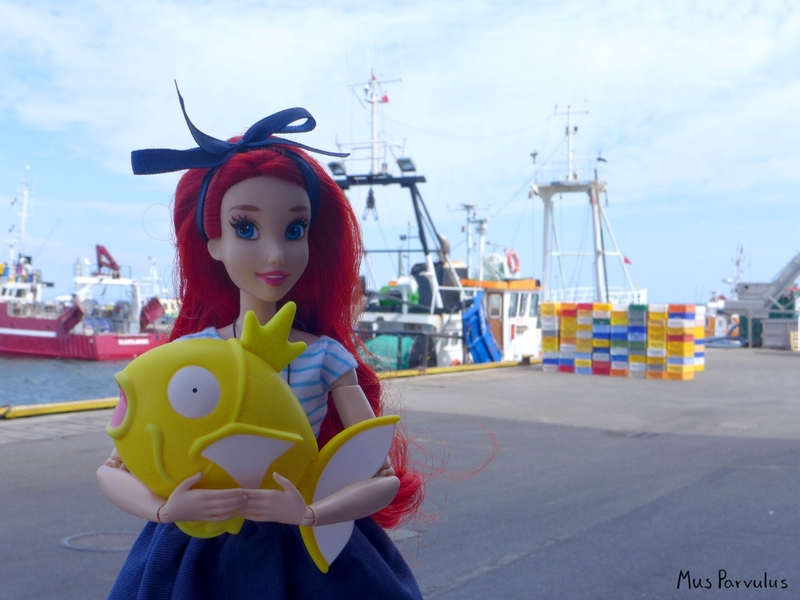 I spent this summer in a small town with a small port, but I took the train just to go to a bigger port in the area. I’m glad I did – this port had a great feel to it. 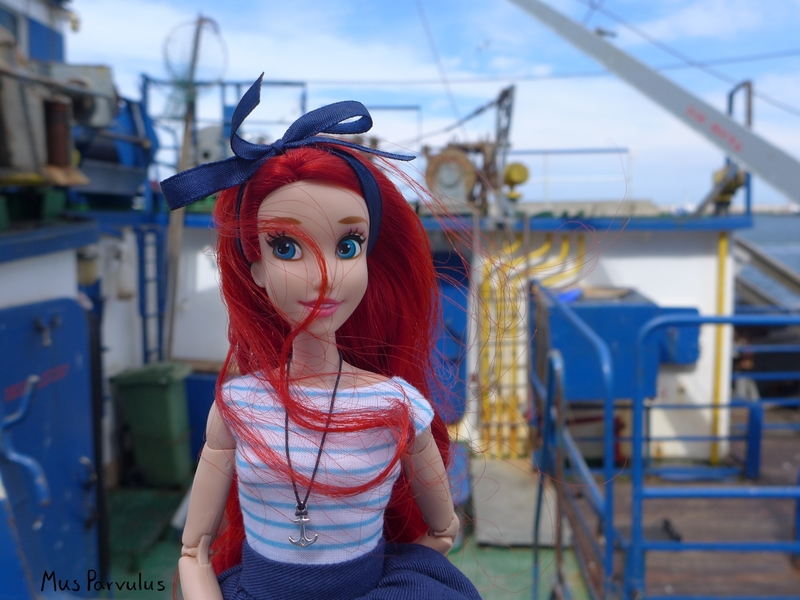 Big cutters, lots of them in blues and reds with white details, very much nautical style. 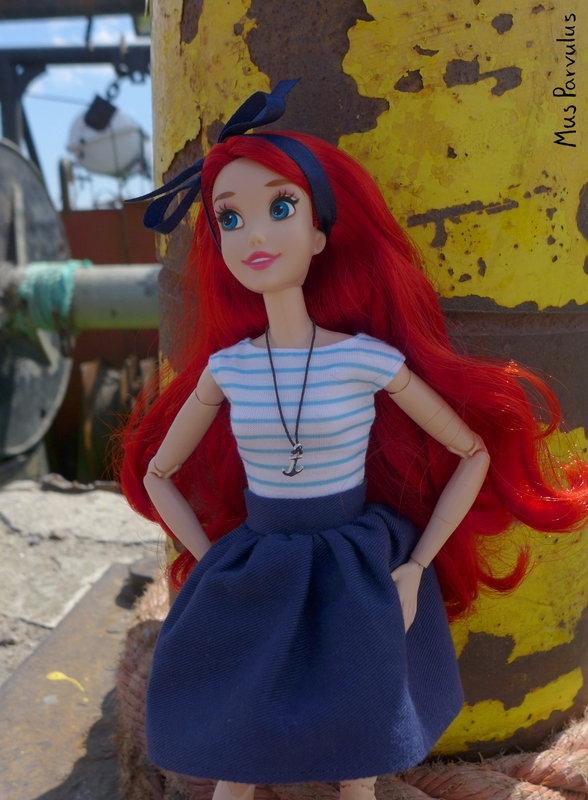 Speaking of nautical, Ariel was made to rock it. 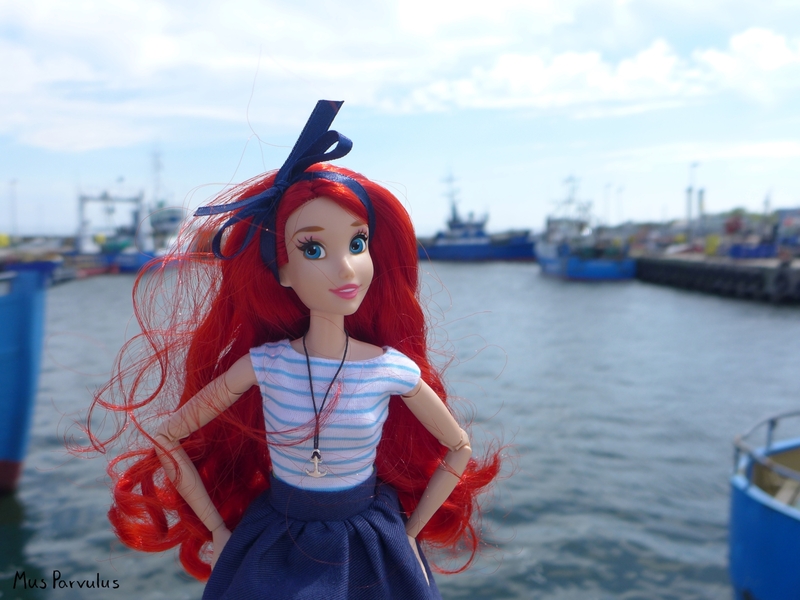 Not only because of her mermaid background, but also because this colour scheme works great with her hair. 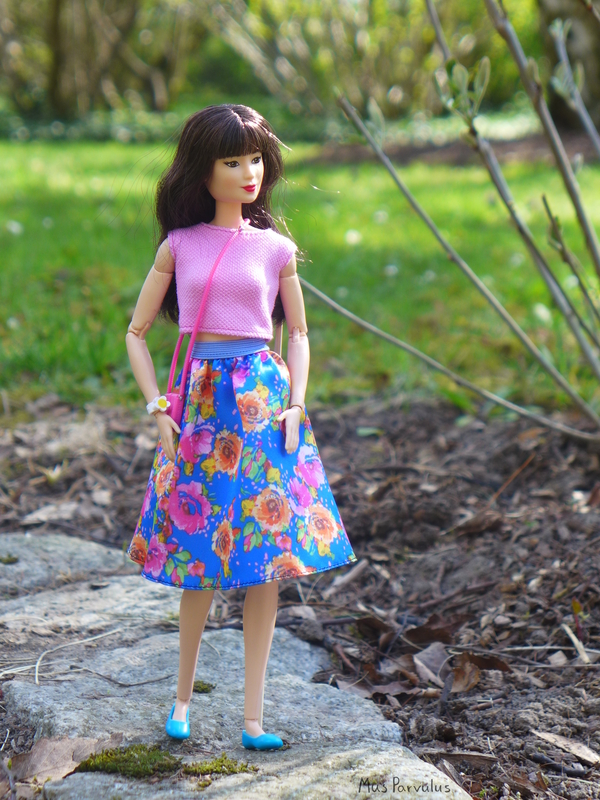 The outfit is a simple gathered skirt I made worn over a Barbie dress, the same one as featured in this post. Its striped top was just right, plus I really like to avoid sewing shirts when I can. The shoes come from an accessory pack (more info here). I like to think this outfit has a retro feel to it as well. There isn’t a particularly deep idea behind including the little guy, other than him fitting the theme and me liking Pokemon. I was very excited for this photo shoot, but I was nervous too. Part of it was knowing that if I don’t get it right, there won’t be enough chance soon – not until the next summer vacation. 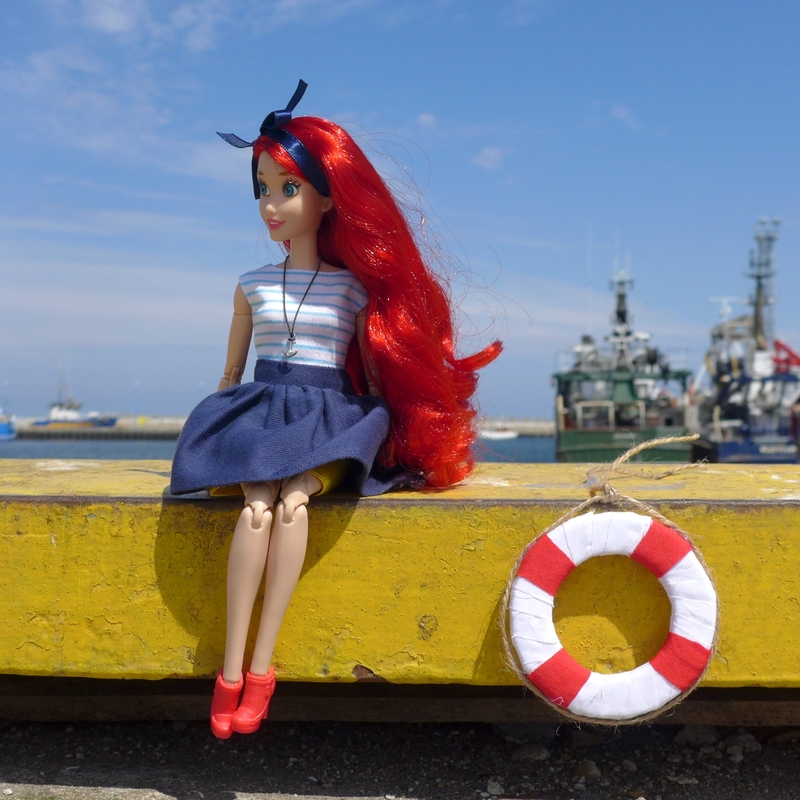 The other part is being the weirdo with a doll kneeling on the dock. However, after you start, you get in the zone and forget about the people. I asked mu husband, who was there with me, reading a book on a bench nearby, if people did look at me. He confirmed. I don’t feel comfortable with the thought, but I guess it goes with the hobby. Overall, I’m very grateful for this trip and the awesome views it provided, for the photos and for me to enjoy 🙂 I’m pretty happy with the pics I brought back with me.